Automated E-Learning Science Reviewer (General Science & Physics) for UPCAT, ACET, DLSUCET, USTET, NAT, CSE, NMAT, etc. This Automated E-Learning Science Reviewer (General Science & Physics) for UPCAT, ACET, DLSUCET, USTET, NAT, CSE, NMAT, etc. was made to help people prepare for the University of the Philippines College Admission Test (and other college entrance examinations like those of ADMU [ACET], DLSU [DLSUCET], UST [USTET], etc. ), National Achivement Test (esp. Grade 6 and Higshschool), Civil Service Examination, National Medical Admission Test, and others. Read more about Automated E-Learning Science Reviewer (General Science & Physics) for UPCAT, ACET, DLSUCET, USTET, NAT, CSE, NMAT, etc. Automated E-Learning Science Reviewer (GS-All 2) for UPCAT, ACET, DLSUCET, USTET, NAT, CSE, NMAT, etc. This Automated E-Learning Science Reviewer (GS-All 2) for UPCAT, ACET, DLSUCET, USTET, NAT, CSE, NMAT, etc. was made to help people prepare for the University of the Philippines College Admission Test (and other college entrance examinations like those of ADMU [ACET], DLSU [DLSUCET], UST [USTET], etc. ), National Achivement Test (esp. Grade 6 and Higshschool), Civil Service Examination, National Medical Admission Test, and others. Read more about Automated E-Learning Science Reviewer (GS-All 2) for UPCAT, ACET, DLSUCET, USTET, NAT, CSE, NMAT, etc. Automated E-Learning Science Reviewer (GS-All 1) for UPCAT, ACET, DLSUCET, USTET, NAT, CSE, NMAT, etc. This Automated E-Learning Science Reviewer (GS-All 1) for UPCAT, ACET, DLSUCET, USTET, NAT, CSE, NMAT, etc. was made to help people prepare for the University of the Philippines College Admission Test (and other college entrance examinations like those of ADMU [ACET], DLSU [DLSUCET], UST [USTET], etc. ), National Achivement Test (esp. Grade 6 and Higshschool), Civil Service Examination, National Medical Admission Test, and others. Read more about Automated E-Learning Science Reviewer (GS-All 1) for UPCAT, ACET, DLSUCET, USTET, NAT, CSE, NMAT, etc. Automated E-Learning Science Reviewer 1 for UPCAT, NAT, CSE, NMAT, etc. This Automated E-Learning Science Reviewer 1 for UPCAT, NAT, CSE, NMAT, etc. was made to help people prepare for the University of the Philippines College Admission Test (and other college entrance examinations like those of ADMU, DLSU, UST, etc. ), National Achivement Test (esp. Higshschool), Civil Service Examination, National Medical Admission Test, and others. Read more about Automated E-Learning Science Reviewer 1 for UPCAT, NAT, CSE, NMAT, etc. The University of the Philippines College Admission Test, commonly known as UPCAT, is part of the admission requirements of the University of the Philippines, administered to graduates of Philippine and foreign high schools.Composed of Test in Math, Science, Filipino and English. DISCLAIMER: This is not an official Product of DEPED,CHED or any educational institution. This is just to help you in your UPCAT TEST. 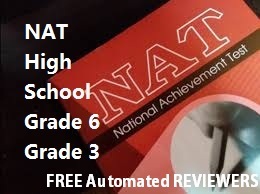 The National Achievement Test (NAT) is required for every high school that is being held yearly. The NAT consists of subjects like English, Math, Filipino, Araling Panlipunan, Critical thinking, Examinee's Descriptive Questionnaire (EDQ) and Science. Science is a very broad subject which needs a lot of study and review to be able to make it with the subject. It needs a lot of perseverance since it is a combination of different subjects where you have to compute, to memorize and others. It is difficult, yes but very interesting subject. Our life is a science so let us come and join you to study, explore and appreciate its beauty. Learning is fun. Learning Science is more fun. This science reviewer is a compilation of different branches of Science consisting of Biology, Physics, Chemistry, Ecosystem and Botany. It is in the easiest way to review without being bored in answering these questions. It will totally help you because you can easily get back to those questions and review at them anytime you want.